German steel producers and distributors are facing structural challenges, as lower steel prices and competition from Asia hit margins. 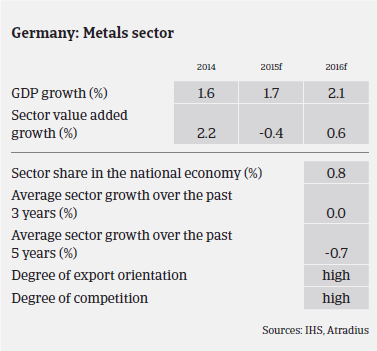 The German steel and metals sector (with its main subsectors metals manufacturing, wholesale of metals and ores, iron and steel) is heavily dependent on the overall development of the German economy, especially on the performance of construction and the export-oriented sectors such as mechanical engineering and automotive manufacturing. In 2014, Germany´s steel production reached 42.9 million tonnes of crude steel, which is about the same level as in 2013. According to the German Steel Association, German steel production increased 1.5% year-on-year in the period January-June 2015, and orders increased in Q1 of 2015. However, order income and order backlog were mainly driven by orders from abroad, while domestic order income and backlog decreased 3.8% and 5.3% respectively. Apparent steel use is expected to grow 2.1% in 2015. Despite increasing orders and production, German steel producers and distributors are facing some structural challenges. In 2014, steel prices decreased 10% and continued to decline further into 2015, mainly due to global overcapacity (especially in China). Another reason is the growth in imports from foreign competitors, which continues to have a negative effect on the turnover of businesses. In many cases producers are unable to pass on increased production costs. Margins remain under pressure, and net profits have dropped as imports from China and India hit the European steel industry (Chinese steel exports increased 28% year-on-year in H1 of 2015). 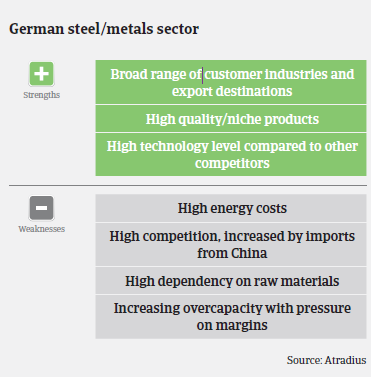 Moreover, the German steel and metals sector is heavily affected by high energy costs. Additional annual expenses of EUR 1 billion to 1.5 billion, brought by the decision to abandon nuclear energy in Germany, are expected for the whole sector. While profit margins are shrinking, the general equity and liquidity of steel businesses in Germany are better than the manufacturing industry average, except for small wholesalers without pre-fabrication and/or steel service activities. The German steel sector remains resilient with a competitive edge, due to its high technology products. We have seen no change in the payment behaviour of companies in the steel and metals sector over the past couple of months, with payments taking, on average, between 30 and 45 days. The number of non-payment notifications in the last six months has been stable and we do not expect an increase in payment delays throughout the rest of 2015. Overdue payment days have decreased in H1 of 2015 compared to H1 of 2014. We also expect steel insolvencies to level off or to decrease slightly in the short-to-medium term (down by about 4% year-on-year in 2015), in line with the overall trend in German business insolvencies. That said, the steel/metals trade and pipe manufacturing segments face more troubles than other subsectors. The market is difficult due to strong competition and low margins; especially for small steel/metals dealers without additional business like prefabrication and low equity ratios. Sooner or later market adjustments will have to take place. The same applies for the piping business, which is characterised by overcapacity and strong international competition (especially from Italy). Margins are very weak and some companies even accept losses in order to gain orders. The sector suffers from decreased oil prices which led to many oil and gas exploitation and pipeline projects being postponed. Our customers’ demand for credit approvals in this sector has been high for a couple of years, and in general our underwriting policy remains fairly relaxed. 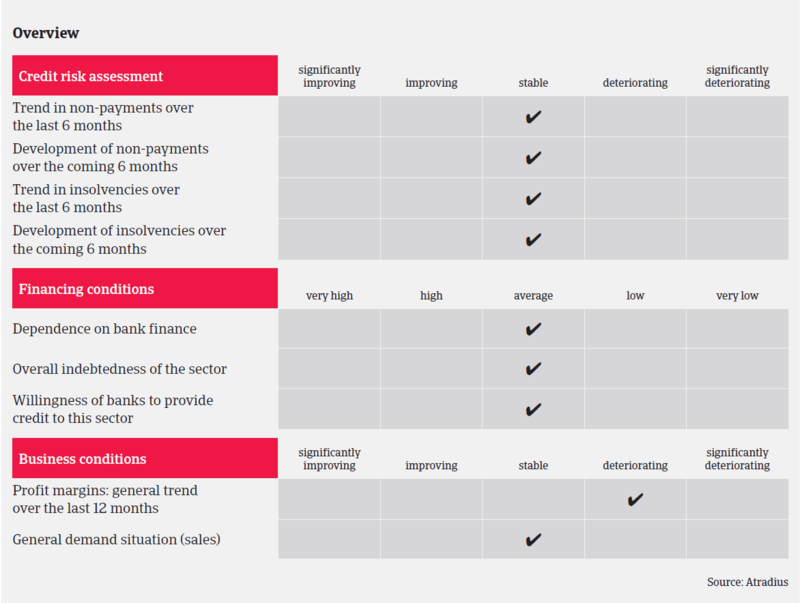 We pay particular attention to recent financial information (balance sheets, interim figures, bank status, payment terms, duration of contract, order volume, payment behaviour). However, we remain more cautious about steel companies supplying the automotive industry. This subsector is traditionally very competitive and, because it is sandwiched between steel producers and car industry buyers, it suffers from considerable pressure on payment terms and margins. The same goes for non-ferrous metals producers and processors, which have to cope with volatile price development and a need for stock reduction. Additionally, our underwriting stance is more restrictive on smaller steel traders and pipe manufacturers due to the on-going problems in those segments. The German ICT sector generally has good growth prospects, but low margins, sharp price erosion and steep competition lead to an on-going trend of consolidation. In 2015 we expect the construction sector in Germany to perform well and construction insolvencies to decrease by 3%, less than the 5% decrease forecast for business insolvencies in Germany overall.